I had a meeting with our office manager today to go over the books and was pleasantly surprised--I made a lot more last year than I thought I did! I am so glad because DH is always so stressed out about money (no matter how much we have) so at least I can tell him the good news that I am earning more than we thought. Maybe this would help him come around to the idea of a third kid (he always keeps saying we can't afford another). 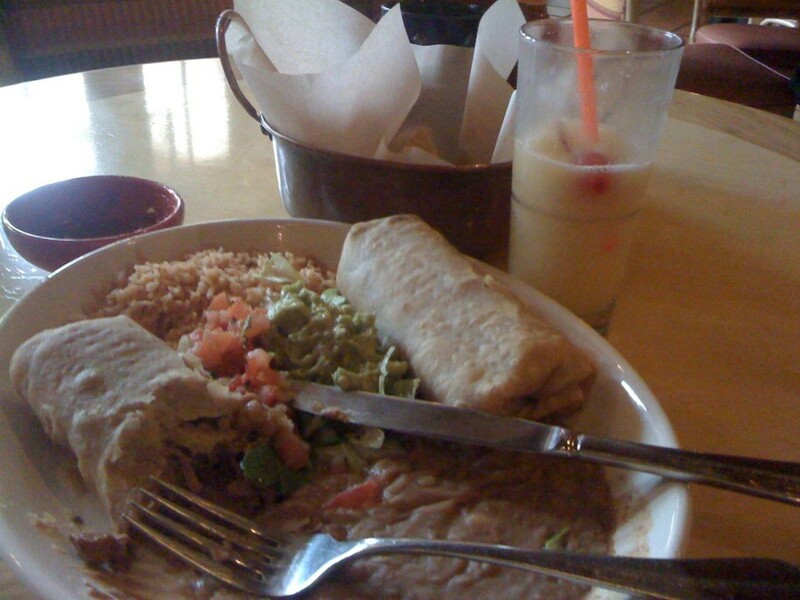 So to celebrate I went out to lunch, by myself, to a Mexican restaurant (my favorite food). Here is my shredded beef chimichanga and virgin pina colada. Yum! I haven't eaten out by myself in ages--feels so decadent, LOL! 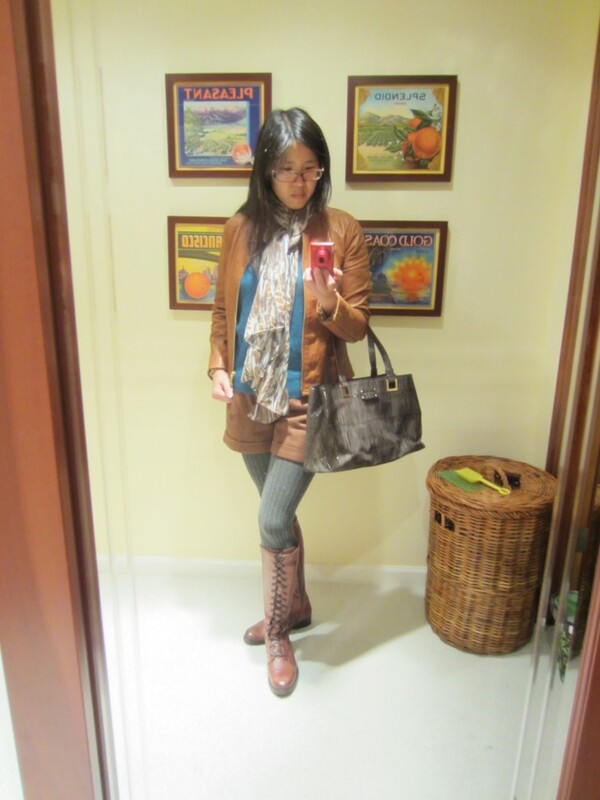 So, that's where I wore my outfit today. And in my previous thread someone mentioned that it seems I don't have any of my own hobbies anymore now that I have kids. 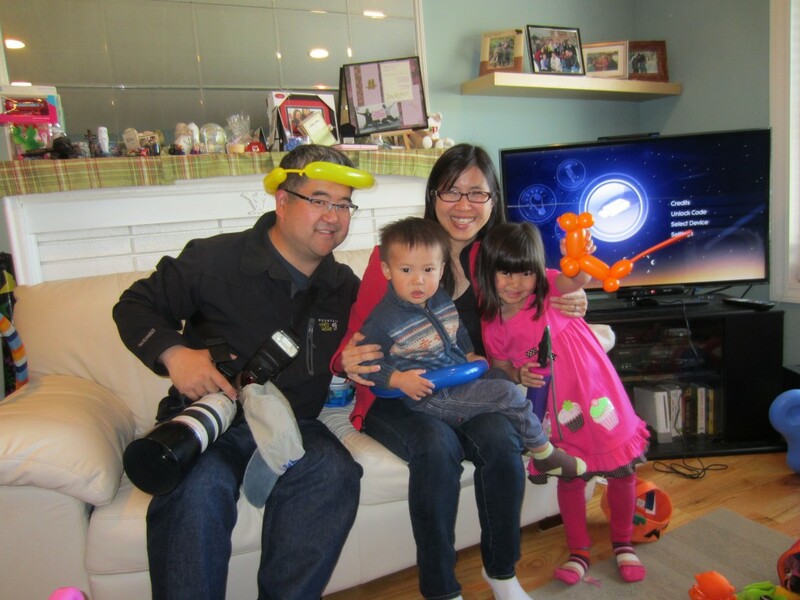 Yes, that is true, my kids are my "hobbies" now. I don't have any other "hobbies" other than YLF and my mommy board, which is why it's tough when DH doesn't understand why I like to spend time doing it. He has his photography and video games so I try to do it when he's playing his games. But I just found a possible new hobby--making balloon animals! 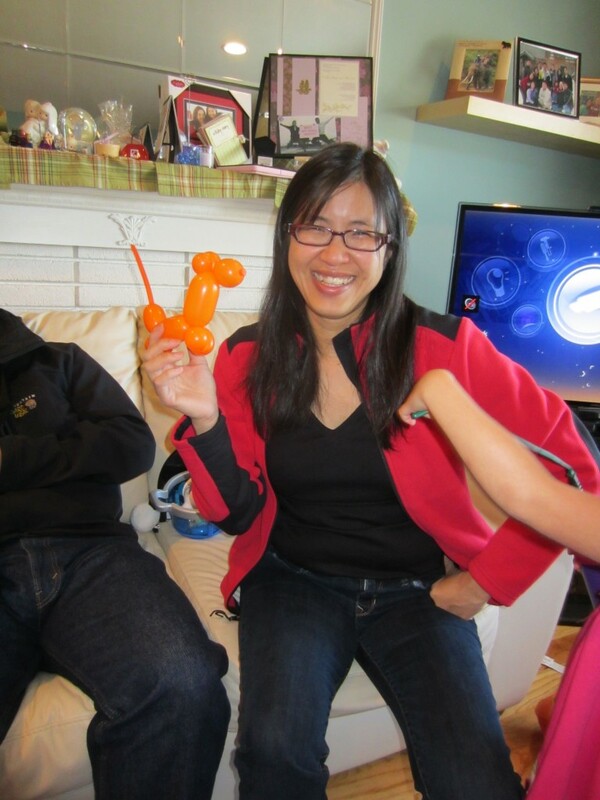 We went to my niece's birthday party last weekend and one of the dads there was making balloon animals for the kids. He said that once he had to wait in line for a half hour to get a balloon animal for his daughter and he said "Never again!". So he went onto YouTube and learned how to make balloon animals himself. I thought that was hilarious but also very smart! 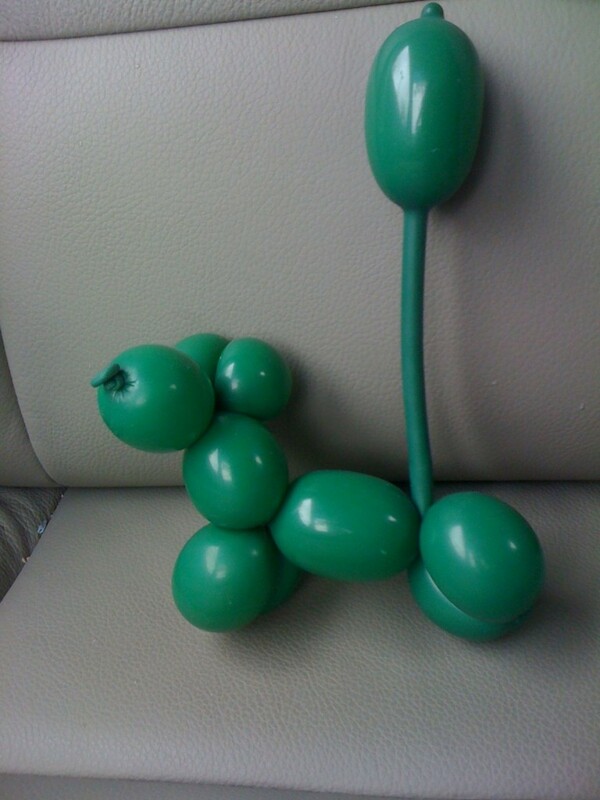 I tried it myself and figured out how to make a balloon dog, it wasn't that hard and was a lot of fun! So here are my first attempts at becoming a balloonist. I think I may try to check out YouTube and learn how to make some more animals, so that in case my day job doesn't work out I'll have something else to fall back on, LOL! 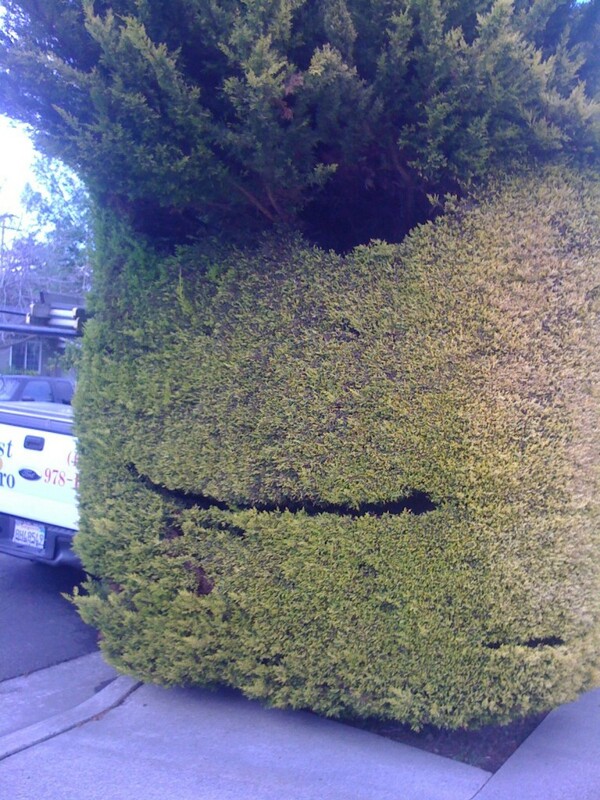 And here's a bonus pic of a bush that looks like a smiling pineapple. Have a good day everyone! Yay for fun and frivolity!!! I'm glad things are looking up, Natalie! Yay, congratulations on your earnings for last year! Your shorts outfit looks perfect for the day's activities. I love Mexican food too and your plate is making me hungry! How cool about the balloon animals; maybe you could have that as a side job (just kidding)! Yum, chimichangas! One of my favorites! My husband doesn't think I have enough hobbies either. I have two kids, work full-time and I'm perfectly happy. I read a lot, does that count as a hobby? I run several times a week too, but that seems closer to a chore (even though I like running) than a hobby. I'm totally craving Mexican right now. It's so good to see you focusing on the good times and the good things in life, Natalie! You're an inspiration, because I know it can be hard when you're feeling a little blue, whatever the reason. Hope the bush and the balloon menagerie and the big Mexican plate made you grin wide today. I now have to go cook some chilli! So glad you got good news and had a fun lunch. Your sense of humour is intact, and that's so important! I am still hoping you and your husband will be able to figure out what's eating him about your participation in YLF so you can enjoy the time you spend here without worries. I love the shorts + tights outfit! What a fabulous meal, how luxurious to eat it solo! And you all look like you're having a fun day (didn't realise DH was into photography - of course, your action pics are so beautiful!) and balloon animals sound like a soothingly attainable and silly-in-a-good-way hobby! Craving Mexican now :) Mr. Pineapple Bush is pretty funny. Cute outfit with the shorts. Personally I have a weird fear of balloons popping. They make me nervous. This post is so full of delightful-ness! I just had to smile back at that pineapple, and at you rocking those wool shorts. Nice. Yay, for a fun day! Your outfit is so cute and I'm super jealous of your lunch!!! :-) Your balloon animal is fun, too. BTW, I don't believe that there in not being able to afford kids , we had all four of ours when DH was in Grad school and I was a stay at home mom ;-) Anyway, I hope you can talk him into it! Your outfit looks so fun and polished at the same time and you must be feeling so proud and confident after hearing the good news about money. I am sure your hubby will understand. Mexican food is one of my favourites too. OH my goodness, Natalie, this post had me smiling like a madwoman!!! SO happy for your GREAT news - and what a DELICIOUS way to celebrate! The chimichangas look sooo good. Mmm - I love Mexican too. Steak fajitas, yes please! And what an unexpected burst of creativity - learning how to make balloon animals!!! We never know what will inspire us, eh?! Love it - what a fun thing to do, especially as a mom of 2. Wicked fab. I say go into the pediatrics ward and show your creations off! Yay! My dh has gotten a bit tired of the time I have been spending on " that fashion blog" lately so I am totally glad you are finding a middle ground! Love the Mexican food yum and balloon animals! How fun... You will be the most popular mom everywhere you go when you whip up cute little balloon dogs!